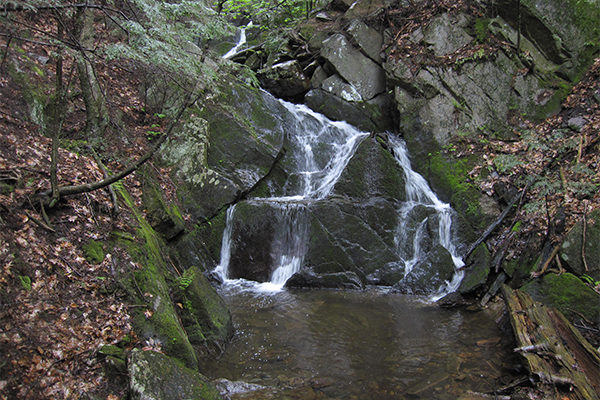 There are a few waterfalls tucked in Massachusetts' biggest state forest, October Mountain State Forest, but Schermerhorn Gorge is probably the pick of the lot. In total, the horsetails that adorn this outlet stream are 30-feet tall. The upper and lower sections are each roughly 15-feet in height. The bottom portion of the falls, which features two segmented set of horsetails, is the most photogenic-assuming you are comfortable enough to scramble down to the base of the falls. The entire gorge is pretty and the falls are certainly the highlight of it. Water quality appeared OK at the site, and so the small 2-3 foot deep pool at the base may be refreshing for a quick dip. The trail to the falls starts immediately across the street from the small parking area. Follow the blue-blazed Gorge Trail upstream as it climbs moderately with the brook on your right. The trail mostly follows directly parallel with, and within view of, the stream. However, there is a short section of trail that briefly leads away from the brook to avoid a retired section of slippery and steep trail. The main trail quickly swings back and reaches the main falls shortly thereafter. The view from the trail is less than admirable, but some hikers may be able to navigate down a steep and slippery slope down to the base of falls with care. Take note that the Gorge Trail can be modified into a loop using a trail map obtained online from the park's website. From I-90 (the 'Mass Pike') in Lee, take exit 2. At the end of the off ramp, take a right onto US-20 west. Follow US-20 west for 1.2 miles towards Pittsfield and take a right onto Center St within the downtown area of Lee. Follow Center St. for 0.3 mile and bear left onto Columbia St. Follow Columbia St. for 0.7 mile and bear left as the road turns into Bradley St (although there is not typically a sign for Bradley St here). From here, drive 0.3 mile further and take a right onto a 50-foot long connecting street that is actually a continuation of Bradley St. At the end of that short stretch of road, take an immediate left, following signs towards October Mountain State Forest. This road is also a continuation of Bradley St. Follow Bradley St. for 1.7 miles additional miles from here (staying straight through an intersection at 0.4 mile and passing the state forest campground on the right at 0.8 mile) and you'll reach a junction at the southern tip of Woods Pond. Take a right onto Woodland Rd (no street sign in 2017). Follow Woodland Rd. for 0.8 mile (ignoring a paved road that heads uphill after 0.5 mile) and there is a small one vehicle-sized parking area on the left just after crossing a bridge over the brook that the falls lie on. Take note that driving to this trailhead involves several miles on dirt roads that are fairly well-maintained. Most vehicles should be OK on these dirt roads under normal conditions.